I have finally finished work on sets #8 and #9 of my Necronomicon Pages series. This brings the total to 36 pages (and one more that was created for another project and is not included in any set). 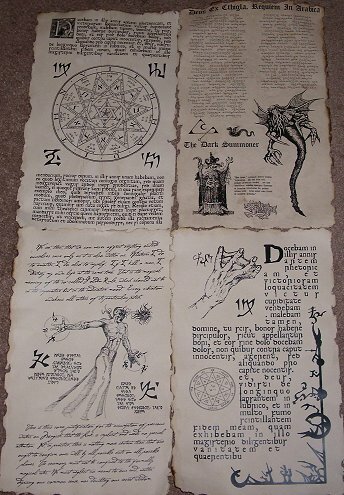 All nine sets are currently available on my Etsy and ebay pages. 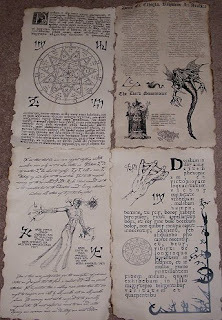 Like the previous sets in this series, they include cryptic text, macabre artwork and unique detailing (there are no burnt edges or blood spatters on the ones pictured but there are on the finished product). the artwork, as before is a mixture of mideval woodcuts and original artwork by artists such as myself, Zarono and Darren Campbell. Those who purchase the entire set as a whole get a small discount on the overall price, and I also try to stuff in a couple of bonus items for those customers too. The first print run of the new series was only 10 copies and three of those have already sold on eBay. This is not a limited series, but if you want to be the first kid on your block to complete your set, you better get them fast before this printing sells out or you may face delays while I work on another batch. My shop has been closed for the winter, due to high heating costs, and I haven't been in the workshop as much as I should have in the past few months. But I did manage to get down there for a few days to complete work on a commission that I got just before the shop closed for the season. A regular customer of mine had previously spoken to my clerk about the book repair and recovering that I do. 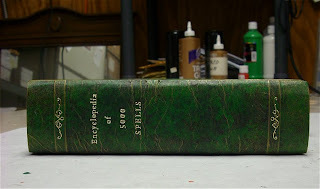 He managed to get in touch with me just in time to commission me to repair and recover two very large and heavy hardback books from his collection. Not that either of them were all that old, or even poorly made. 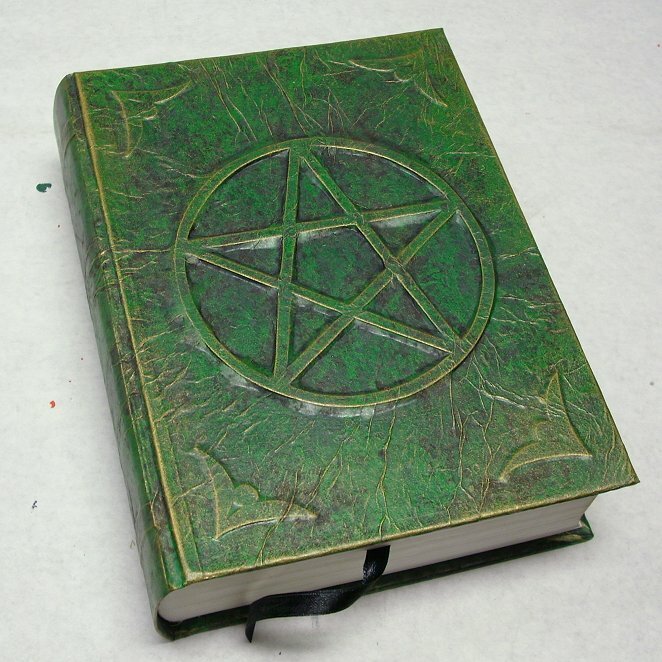 In fact one of them had nothing wrong with it at all, but the other had seen quite a bit of use and the covering was starting to come off of the spine. He wanted me to repair it and recover both so that they would look like a matched set. The books in question are both from author Judika Illes. 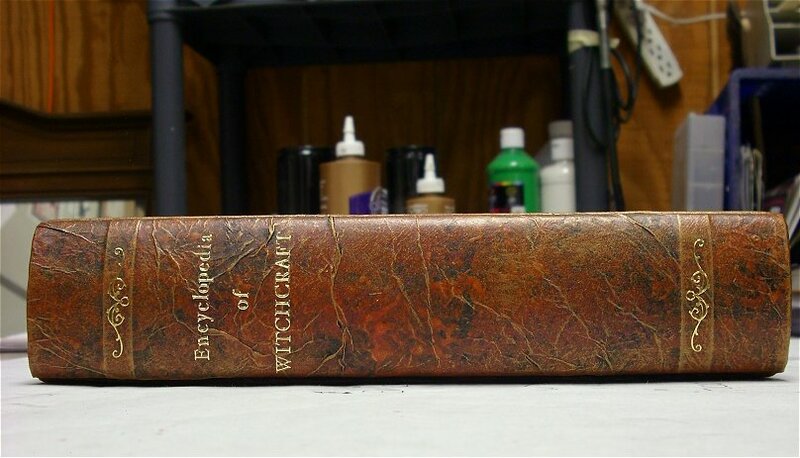 The Element Encyclopedia of 5000 Spells, and The Element Encyclopedia of Witchcraft. Both of with are very good books that I recommend. They can be a little hard to find in bookshops, no only because they are metaphysical books, but as the publisher, Element (a division of Harper Collins), does not seem to have a distributor in the U.S. I eventually got a few copies for the shop by ordering from a distributor that is based in Canada. Ms. Illes and I actually exchanged a few very nice emails over the subject a little while back. 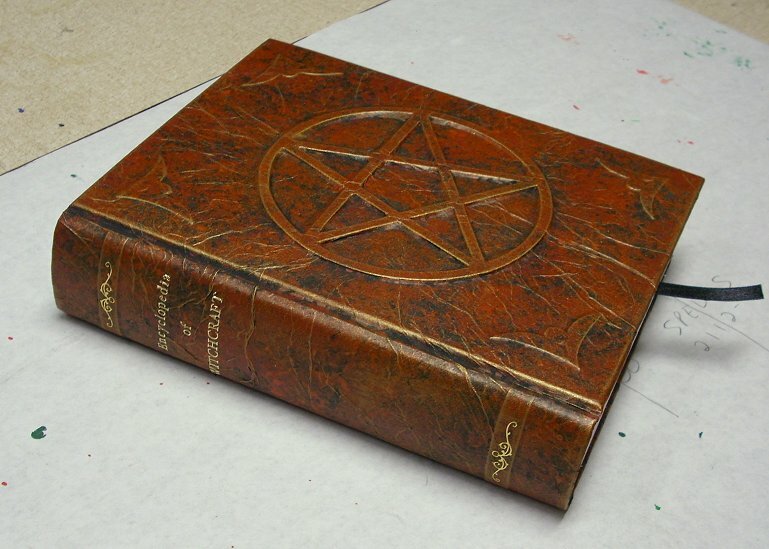 The customer requested the painted kraft paper covering with a large raised pentagram in the center. He wanted both books to match except for their color. He wanted one to be green and the other to be red. 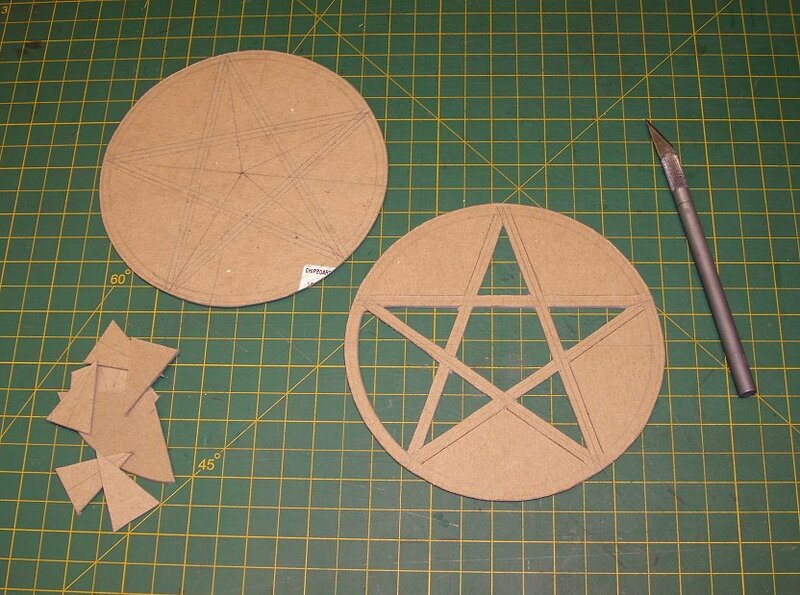 Laying out a pentagram seems like it would be easy, but it's not. In order to get it just right you need a good protractor and the ability to do some calculations, or a very good background in geometry. The geometric construction of a regular pentagram is one of the more complicated ones I have ever seen for a simple geometric figure. 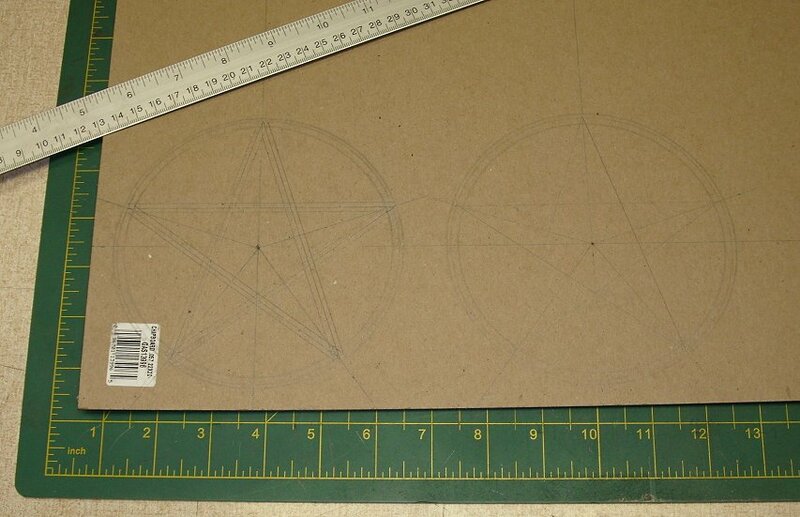 In this case I went with the protractor. 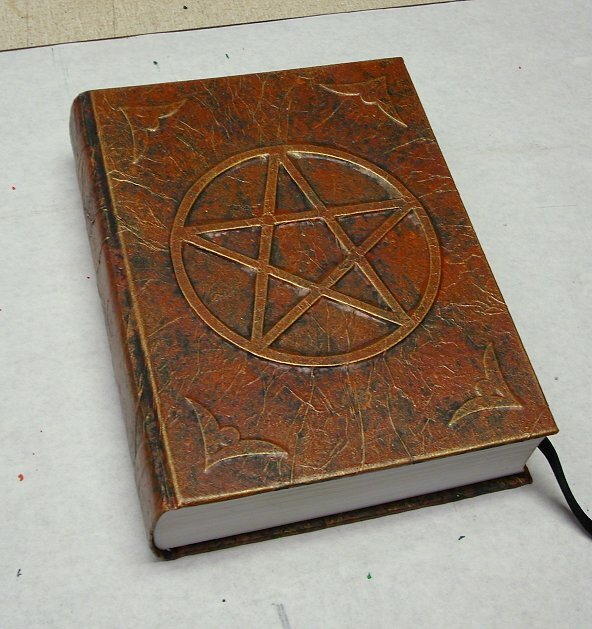 You actually have to draw the pentagram three times. Once to get it right (which becomes the center line) and then again shifting the lines a few millimeteres to the left and then to the right, so that you have lines you can actually cut on. Most of the books I recover have flat spines, but these were rounded spines due to the thickness of the books. I was a little concerned about this, but it turned out to be no problem for me at all. I reused the existing front and back book boards and added some material to stiffen and strengthen the hinges and the spine. 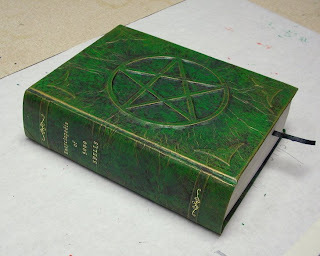 The paper covering was done in the usual manner, with the pentagram underneath. 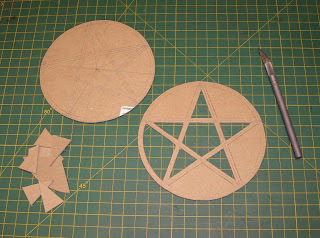 I designed some decorations to add to the corners on the front and back, because the pentagram alone seemed a little too plain. I decided to change from my usual method when it came to pasting down the end papers. I usually mask off the area and use a spray adhesive, which works well at first and dries instantly with no moisture, but I have been having some concerns about this method. 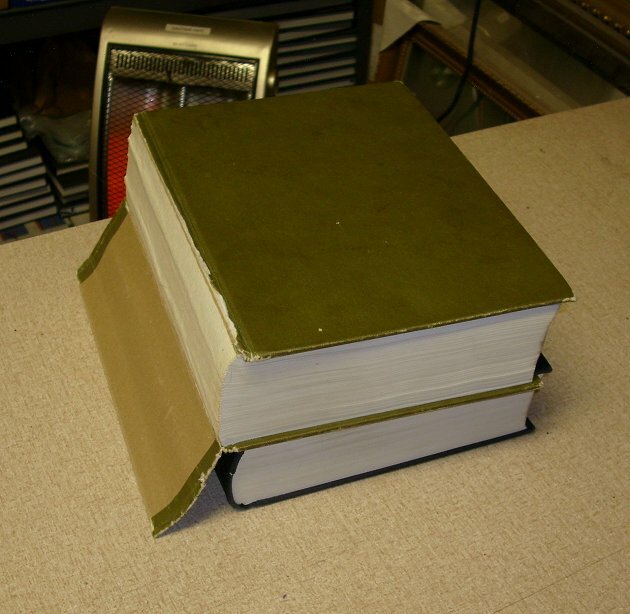 Some of the books I have used it on have, over time, developed wrinkles and puckers in the end papers that I can't explain. Also, the spray glue seems to weaken over time. So instead I decided to use white glue. I used a foam roller to apply it very sparingly and let it sit a moment before pasting the papers down and smoothing it out. It seemed to work out well, and I intend to continue using this method for a while to see if it makes for a nicer finish in the long run. At the last minute, I decided to add some stick-on lettering to the spine to denote the titles of each book. Getting the spacing and alignment right was a big pain, but I think they came out well. I had intended to put the author's last name as well, but to tell the truth, it slipped my mind until after they were picked up by the customer. I have another movie prop commission coming up, so I'll be back in the workshop now for a while. 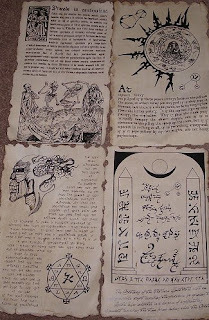 I also have a bunch of steampunk props I am making for a larp for this year's Origins. Those will keep me very busy. I'll be sure to post lots of pics.